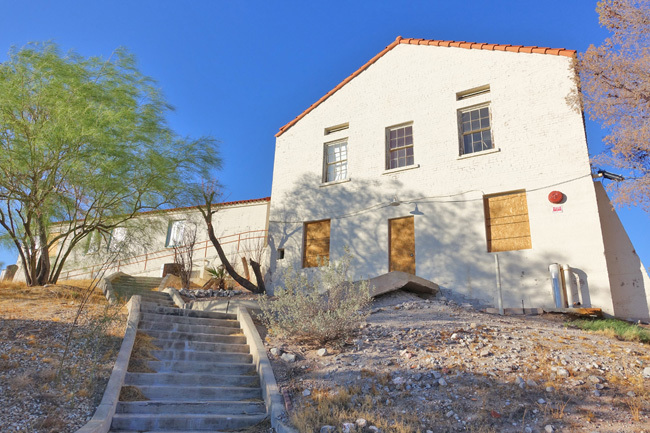 The abandoned Boulder City Hospital sat atop a hill overlooking Lake Mead. From its magnificent vantage point, the old structure kept vigil for more than 80 years, while the man-made lake rose and then slowly fell and the city around it quadrupled in size. 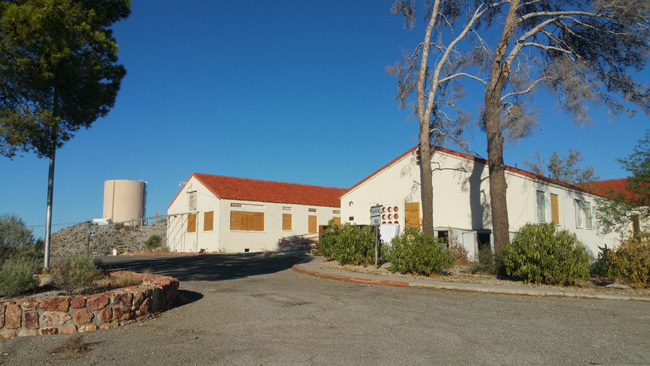 After visiting the remains of the old Boulder City Airport, I headed into town to check out the old Boulder City Hospital. I'd read that the building was facing the possibility of demolition, and wasn't sure it was still standing, but since I was already in the area, I figured I'd give it a shot. 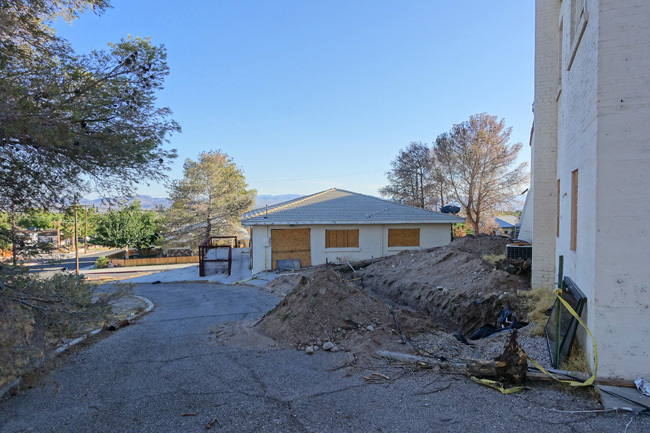 The boarded-up structure sat perched on a hilltop in a tidy residential neighborhood, looking quite out of place among the well-kept homes. I was relieved and a little surprised to find the building intact. 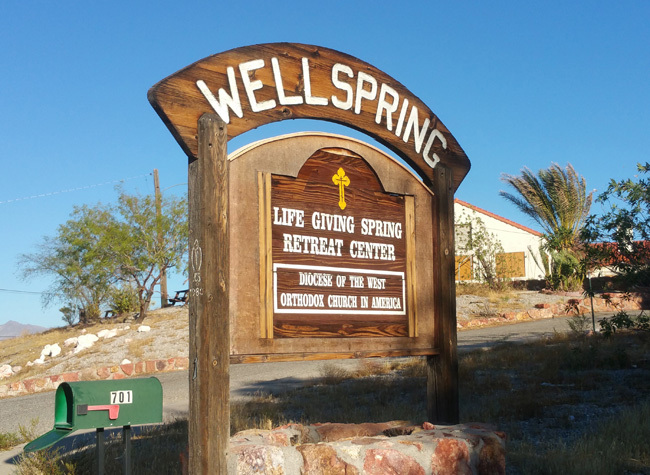 The sign out front still bore the name of the building's most recent tenant, Wellspring Life Giving Spring Retreat Center, which closed in 2009. Furniture and assorted trash was piled out front. The front doors were tightly locked. 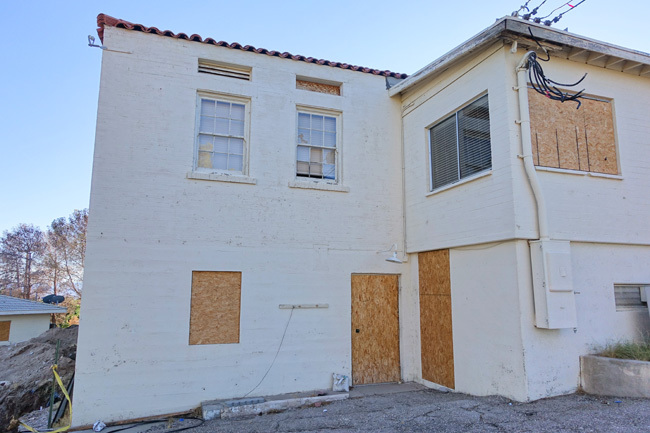 A stop work order tacked to the plywood announced that an appeal had been filed, requesting that the building not be demolished due to its historical status. 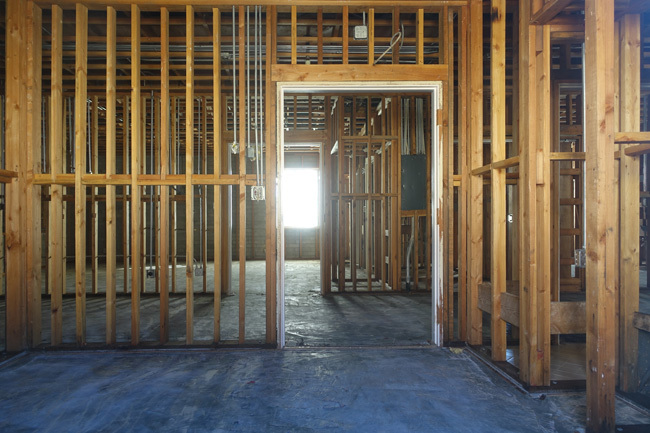 I peered through one of the few windows that wasn't covered with plywood and saw that the deconstruction process had already been well underway by the time the stop work order went into effect. I walked around the outside of the building and snapped a few photos. 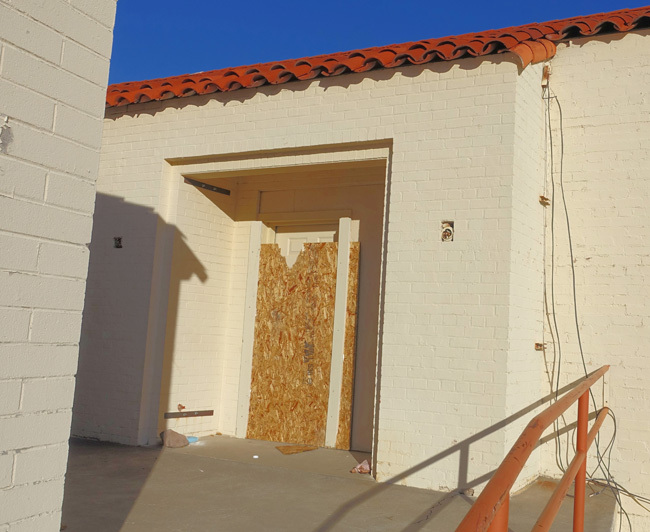 All of the possible entry points were secured shut. Judging by what I'd seen through the window, it seemed like the building was pretty much gutted and there wasn't much left to look at on the inside anyway. 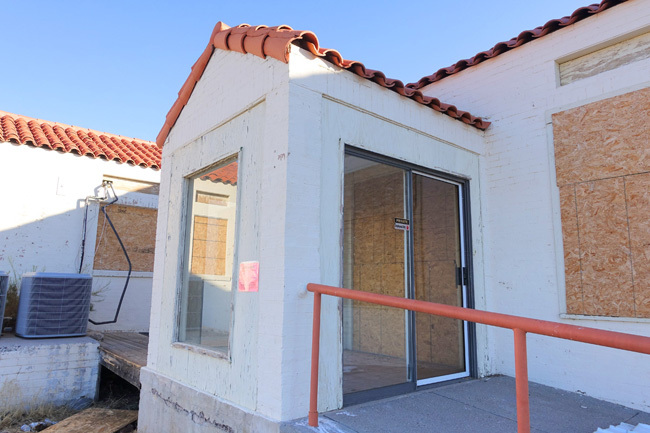 The Boulder City Hospital building (also known as Six Companies Hospital) has a robust history that extends back to the very beginning of Boulder City. 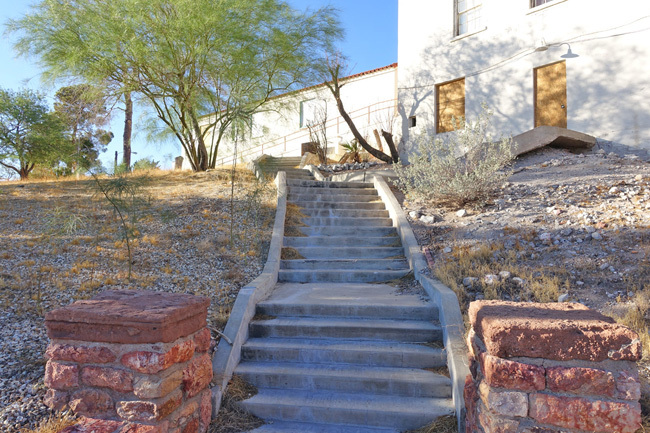 Boulder City was originally a planned city, created to house the workers during the construction of the Hoover Dam. The city, like the dam, was a joint endeavor of the federal government and Six Companies, a consortium of private construction firms. Built during the Great Depression, Boulder City was intended to be a manifestation of optimism, clean living, and the "greening" of the American West. Alcohol and gambling were illegal and the town had its own theater, so as to discourage workers from traveling to Las Vegas for entertainment. 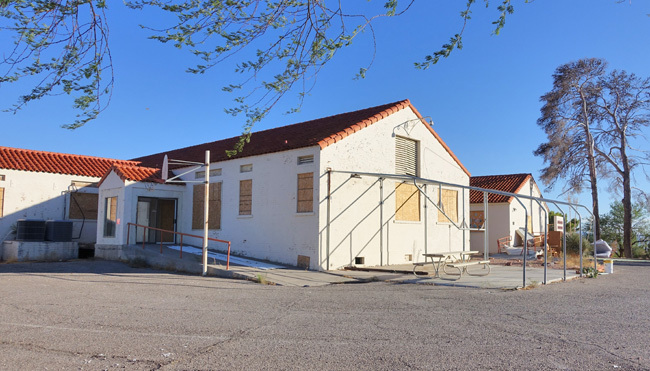 Because the nearest hospital was located in Las Vegas, about 33 miles away, the Boulder City Hospital was built to care for sick and injured workers. It opened in November of 1931 and allegedly cost about $20,000 to build. The hospital originally included a separate 8-bed "Pest House" used for quarantines. It was torn down in 1933 and replaced by an isolation ward. Employees of Six Companies were charged a fee of $1.50 per month to pay for hospital upkeep. Unfortunately their wives and children were not allowed treatment at Boulder City Hospital, and had to travel the 33 miles to Las Vegas for their medical needs. Hoover Dam was completed in 1935 and the hospital was closed. 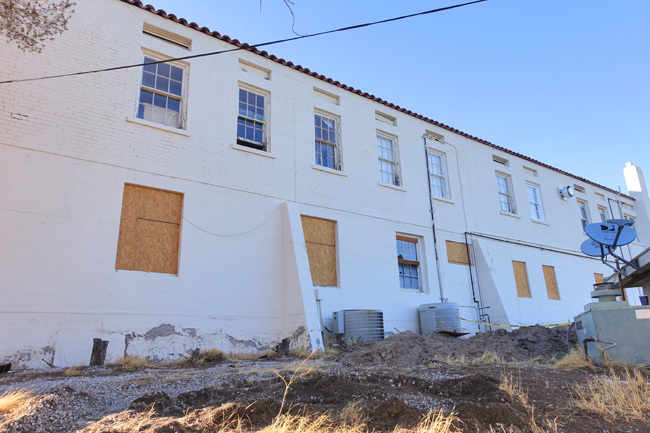 In 1938 the National Park Service took control of the hospital building and used it as a museum for artifacts from the area that would soon be covered by Lake Mead. The Park Service moved out in 1941, leaving the building vacant until the U.S. Public Health Service reopened it in 1943 as a hospital for soldiers injured in World War II. It is said that supplies were so scarce due to the war effort that refurbished equipment had to be shipped in from other hospitals around the country. Residents of Boulder City took part in the effort by helping to clean and repair the equipment and creating a volunteer ambulance service. The Bureau of Reclamation took control of the hospital in 1949, but decided to close it in 1954 due to the financial burden. City residents scrambled to raise the $15,000 necessary to keep the hospital open, and managed to do so within a 2-week window. In 1973, the new Boulder City Hospital opened on Adams Boulevard, and the old building was condemned shortly thereafter. The Episcopalian Sisters of Charity bought the old hospital in 1976 and transformed it into Wellsprings Retreat House. The building was placed on the National Register of Historic Places in 1982. 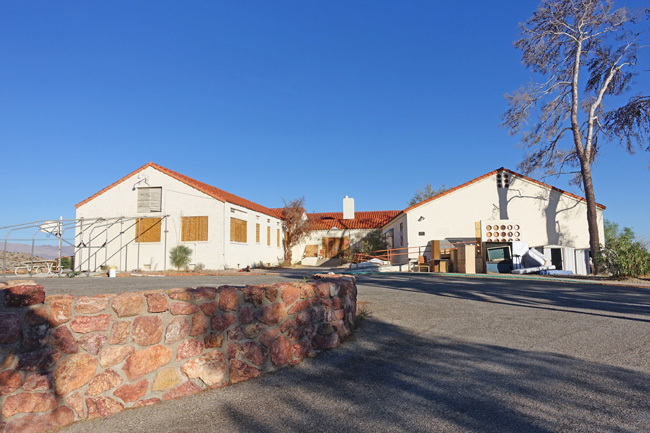 For nearly two decades, Wellsprings served the community as a venue for a variety of events, including church groups, conferences, and Alcoholics Anonymous meetings. It also provided temporary lodging. Guests were asked to help out with simple simple chores. When the Sisters of Charity moved to West Virginia in 2000, Wellsprings was sold to the Western diocese of the Orthodox Church, who modified the name slightly to Wellspring Retreat Center. In 2009, the diocese closed Wellspring and listed it for sale at a price of $1.5 million. In July 2015 a developer named Randolph Schams bought the property for $550,000. 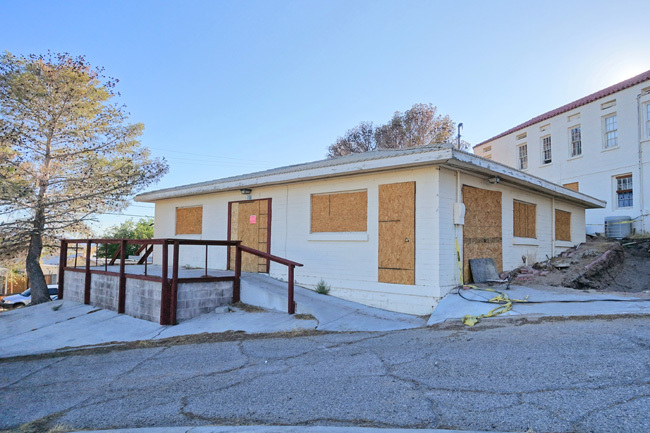 Despite the building's historic status, the city planning commission decided to allow him to demolish it and build a housing development on the site. The decision was controversial. Schams happens to be the city’s planning commissioner, which many saw as a conflict of interest. 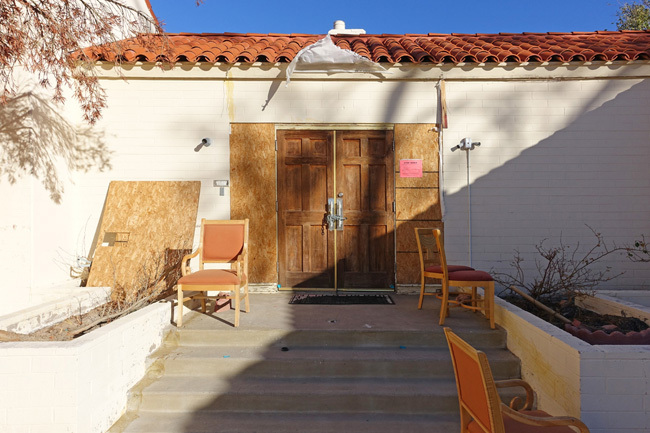 A group of Boulder City residents created the Historic Boulder City Foundation to stop the demolition in hopes of transforming the old hospital into a museum. The effort proved unsuccessful. 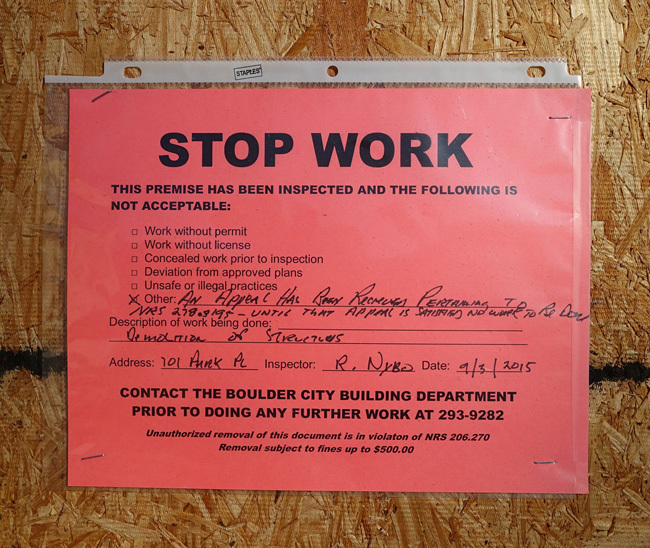 In November 2015 the city council voted to allow the demolition to proceed. 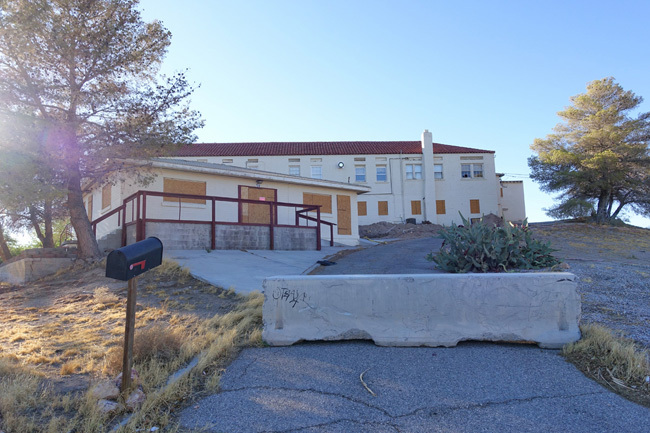 Shortly after my visit, the old Boulder City Hospital building moved to that great big abandoned place in the sky. After a memorable day of exploring Boulder City, I got back on the road and headed into Utah. Come back next week and I'll tell you all about the awesome abandoned creamery I explored. What a shame---you'd think there could have been something it could be used for. It's disappointing that a businessperson can hold a government position that so obviously serves his own interests instead of the people he is supposed to be representing. It's sad to see a significant piece of history get knocked down, and the circumstance makes it all the more frustrating. I live in th UK and have just watched the episode of Ghost Hunters which featured Boulder Hospital.After looking on Google am sad to see that it has now been demolished.What a shame that the money could'nt have been raised to save it. It's a shame that it's been demolished. I'm glad I at least got to have a look at it while it was still standing.